Text © Copyright January 2012, Humphrey Bolton; licensed for re-use under a Creative Commons Licence. To see the browse page, the 1:25000 map in a popup window, or various other options click on 'Links for SE0026' and select the appropriate link. 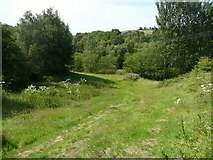 This is the area to the south of the railway, with access only by private roads and footpaths. 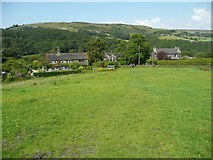 The hamlet of Stubb contains several houses; the one on the right is Great Stubb. This is Little Stubb, typical of a 17C clothier's house. Roger Gate is an unadopted street and public footpath leading to Stubb from Holme End. 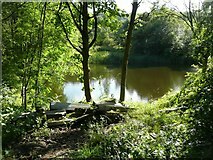 There is a fishing pond off Roger Gate that was the water supply for Holme End Dyeworks. 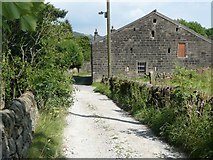 Carr House Farm has access via Carr Lane. This is Carr Lane, an unadopted street and public footpath. Between Stubb and Carr Lane there is a rather nice footpath. The footpath crosses a stream (Stubb Clough) with a pond. 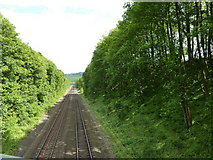 The railway from Manchester to Normanton was opened through Mytholmroyd 1 Mar 1841. The resident engineer was Willaim Gooch. It now carries services to Leeds via Bradford, Manchester, Blackpool and Preston, and also trans-Pennine freight. 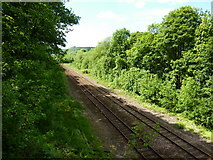 View westward, towards Todmorden, Rochdale and Manchester; ex-Lancashire & Yorkshire Calder Valley main line, Manchester - Todmorden - Sowerby Bridge - Wakefield etc., a major cross-Pennine line, especially for coal. The locomotive is Hughes/Fowler 5P4F 2-6-0 No. 42715. Carr lane crosses the railway on this refurbished bridge. The railway goes over Roger Gate. 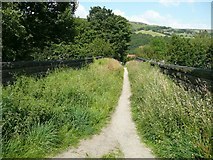 The next bridge carries a footpath from Stubb to Hawks Clough. Old maps show that Paddy Bridge merely connected fields on either side of the railway, and was otherwise just a footbridge as now. 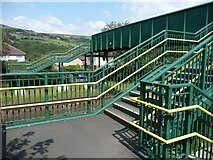 This footbridge, recently rebuilt, links two housing estates. 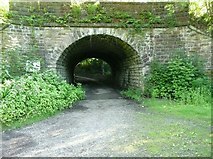 It originally carried a footpath between Stocks Hall and Hawks Clough. Here the railway leaves the square. 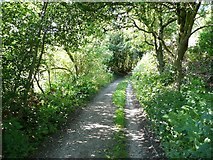 Maps of 1835 and 1850 show that this footpath was the original route of Roger Gate before the lane from the railway bridge to Holme End was made. Holme End Road goes past a council depot, and is a public footpath and part of The National Cycle Network Route 66. 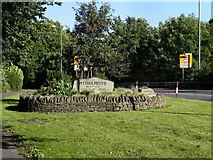 A long, straight suburban road parallel with the main road and now part of Sustrans Route 66. 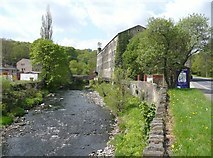 View up the River Calder past the former clog works to the Carr Lane bridge. This bridge was the access way to the house at Hawks Clough before Caldene Avenue was constructed. 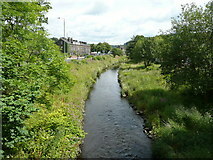 The river has an artificial look about it, due to flood alleviation works in the 1960s. 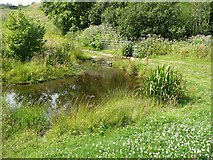 In 1999 further works was carried out by the Environment Agency to restore 'natural' river features to improve the wildlife diversity of the river and bank sides. As one enters the square, there is a welcome to Mytholmroyd. There is also an old milestone, a reminder that whatever old tracks there were previously were upgraded as a toll road, which opened between Mytholmroyd and Hebden Brige in 1768. 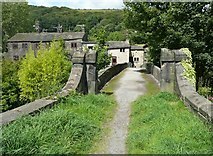 Fallingroyd Bridge, over the canal, was narrow with an awkward double bend. When the canal was closed the bridge was removed and the road improved. To reopen the canal a tunnel was constructed. 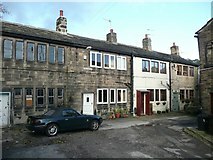 The road passes Walkley's Mill, a former clog works that might become apartment, although the building looks to be in a poor state of repair. 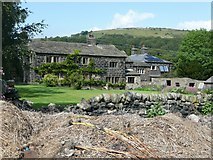 At Hawks Clough we reach the built-up area of Mytholmroyd. 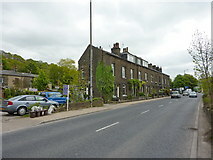 On the north side of the road, The Square is a group of weaver's cottages. Bethesda Terrace is supposed to be named after a chapel, although I haven't found a map that shows it. 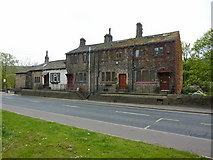 Next there is a disused mill with only a short frontage onto the main road. The lane past it goes to Broad Bottom. The mill is still for sale. (From Link - there is also a photo of a slivering machine) "Could be either wool or cotton. Blending is what they did to get a standard staple. .... Sliver is the first stage after carding, a loosely formed strip of what looks like cotton wool with all the fibres coiled the same way. ..... So sliverer most probably refers to someone running the initial carding engines, never heard it used. Technically, the sliverer could be the small gizmo on the front of the card that takes the sheet and condenses it into a sliver." (Information from Stanley Challenger Graham). 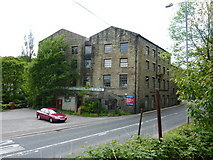 This building was part of Hawks Clough Mill, a cotton mill in 1850 but could have changed to woollen later. This part was called Alexandra Shed on the 1930s map. Calder Terrace is a row of tall 19C houses. Then White Houses are on the south side. This is a row of old cottages (on the 1835 map by J.F.Myers) that look dark despite their name. 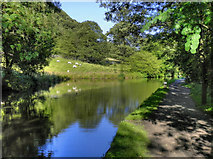 The section of the Rochdale Canal through Mytholmroyd opened in 1798, and the route from Sowerby Bridge to Manchester in 1804. It closed in 1937 and was not subsequently taken into public ownership. Due to the efforts of the Rochdale Canal Society local authority and government funding was made available for its restoration, and it re-opened in 2002. 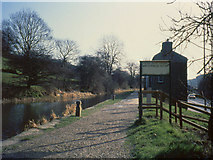 The canal west of Fallingroyd tunnel. 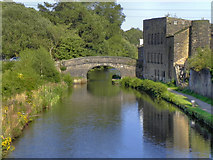 The canal east of Fallingroyd tunnel. Carved wooden figures commissioned by Calderdale Leisure Services for the 2002 Hebden Bridge Arts Festival, sited on the grass between Broadbottom Lock and Burnley Road at Hawksclough, west of Mytholmroyd. By February 2008 one of the gorillas, said to be the male one, had disappeared. There was a report that he had moved to Sowerby Bridge, presumably having walked down the towpath after a row with his wife. However further research revealed that he had fallen over after his feet had rotted, and was in protective custody somewhere in Todmorden Park in the company of a parrot that had similary rotted. The waterbus stop served Walkleys clog factory when it was still a toursit destination, and is probably no longer in use. Broadbottom Lock No.7 on the Rochdale Canal at Hawksclough, west of Mytholmroyd. 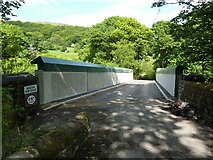 This is Broadbottom Bridge. 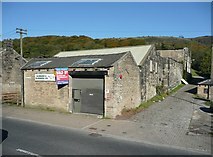 On the right is the disused Alexandra Shed, first known as Hawksclough Shed and renamed on OS maps between 1910 and 1935. 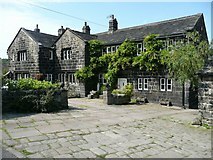 Built on the site of the Wadsworth fulling mill, which existed in 1310. The base of the chimney can be seen on the canal side of the building. It was used for cotton spinning 1840s – 70s and more recently for blending and slithering until it closed c.2002.